Appreciation Ceremony and Group Photo. You are cordially invited to attend a day long excursion called "Cultural Awareness Day" which will take place on the 15th of February. The tour departs from Emirates Palace at 10.00 hrs and will return to same location at 18.30 hrs. Due to a limited capacity of seats available you are requested to confirm your participation at the earlist by contacting Mr. Malcolm Ferrao on the below mentioned details. 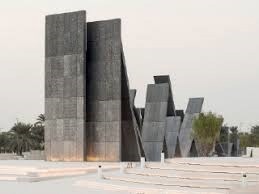 The name Wahat Al Karama literally translates to “oasis of dignity.” The site is a permanent tribute and war memorial to honor UAE’s martyred soldiers and other Emiratis who sacrificed their lives for the service of the nation. Wahat Al Karama is a place where HH Sheikh Khalifa bin Zayed Al Nahyan’s President of UAE vision to immortalize the memories of the heroes of the country, comes to life. The massive expanse of the 46,000sqm wide monument is symbolically located between the Sheikh Zayed Grand Mosque and the General Headquarters of the UAE Armed Forces, using 31 massive aluminium-clad tablets each leaning on the other, signifying the unity, solidarity and mutual support that bind together the leadership, the citizens and the servicemen and women who protect them. 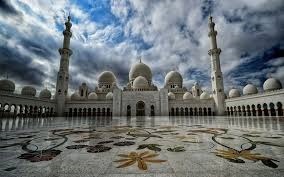 The Sheikh Zayed Grand Mosque stands out as one of the world’s largest mosques, and the only one that captures unique interactions between Islam and world cultures. Sheikh Zayed’s vision for the Grand Mosque was to incorporate architectural styles from different Muslim civilizations and celebrate cultural diversity by creating a haven that is truly diverse and inspirational in its foundation. The mosque’s architects were British, Italian and Emirati, and design inspiration was borrowed from parts of Turkey, Morocco, Pakistan, and Egypt among other Islamic countries, revealing a glistening architectural marvel with an astonishing capacity of 40,000 worshippers and visitors. Lunch at Rixos Saadiyat Island Abu Dhabi main restaurant. This permanent exhibition at the Qasr al Hosn Centre tells the story of Abu Dhabi and its people through the city’s oldest building. Fascinating oral testimonies and historic photographs bring this important monument to life. Contemporary Emirati voices reflect on Abu Dhabi’s history and transformation and Qasr al Hosn’s key role as a vibrant symbol of Emirati heritage, culture and tradition. The unique cultural attraction celebrates the life, legacy, and values of Sheikh Zayed and offers a unique opportunity to immerse in the history and culture of the UAE. The visitor experiences within the Sheikh Zayed Memorial are designed to reveal aspects of the country’s broader social, cultural and environmental heritage, including art, stories, and exhibitions. Spread over 3.3 hectares of beautifully landscaped public space with indigenous flora, the memorial features a Sanctuary Garden including seating areas and a traditional “falaj” water channel, a Heritage Garden rich with medicinal desert plants, and an elevated walkway offering captivating views of The Constellation, the Arabian Gulf, and the city’s dazzling skyline. The centerpiece of the retrospective is The Constellation, a monumental three-dimensional portrait of Sheikh Zayed designed by public artist Ralph Helmick that features 1,327 geometric shapes suspended on more than 1,000 cables. 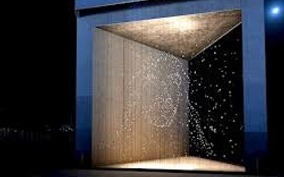 The installation can be experienced differently from multiple vantage points and at night, the shapes shine like stars, evoking the timelessness of the founder’s vision as a guiding light. Set in a 30m-high Pavilion, the artwork is one of the largest art installations of its kind, and unique in its use of abstract portraiture on this scale. The iconic Louvre Abu Dhabi is the first universal museum in the Arab World that translates the spirit of openness of cultures. As one of the premier cultural institutions located in the heart of the Saadiyat Cultural District, the art-lovers dream displays the works of historical, cultural and sociological significance from ancient times to the contemporary era. 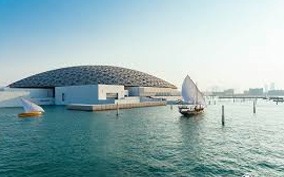 Designed by Pritzker-prize winning architect Jean Nouvel, the Louvre Abu Dhabi encompasses 9,200 sq. m of galleries including the Permanent Gallery and a Temporary Gallery that is enriched by loans from many notable French museums including Musee du Louvre, Musee d’Orsay, and Centre Pompidou.